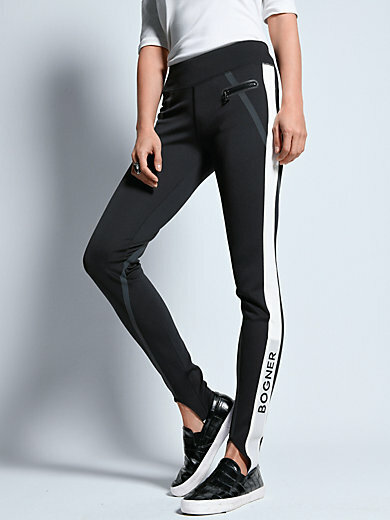 Stirrup trousers by BOGNER. The cult trousers that have made Maria Bogner famous! Cut in a typical narrow shape, made from flattering, super-stretchy, innovative Techno Stretch fabric. These trousers fit like a glove, offer a high degree of comfort and have a slimming effect thanks to balanced out cut with wide stripes and the logo lettering motif. Zipped pocket on the left. Wide elasticated waistband with large BOGNER lettering motif at the back. In 93% polyester, 7% elastane. Inside leg length approx. 34ins. Ankle width approx. 9ins. The stirrup trousers are machine washable.